Falling somewhere between heavy stoner rock and sludgy (post) heavy metal (with an emphasis in both cases obviously on the heavy part!) we have Nashville-based Season of Arrows and this, their Mikey Allred (Inter Arma, Across Tundras and Yautija) produced debut album. With the smoky voice of lead singer Stormie Wakefield serving as every-bit siren's call, Season of Arrows provides the perfect soundtrack for all your witching hour activities with music that is earthy and decidedly fuzzed-over. Made up of a group of (most-likely given the album's clear approach to song-writing) veteran musicians (some of whom have been in and out of various bands together since 1998!) 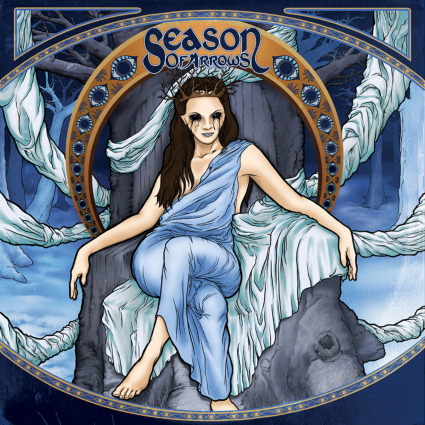 Season of Arrows has the sound of a much-longer running act then one would normally expect to hear from a debut release. Also featuring the talents of guitarists Brandon Shepard & David Gates, bass guitarist/backing vocalist Shawn Van Dusen and drummer Brad Lawson Season of Arrows must be one of Music City's hottest tickets as the band's music is muscular and it pulses with fervent energy! There's not much more that needs to be said about this five-piece band from Tennessee other then to suggest that for those who choose to walk a different path, one under the cover of darkness where the sounds of the night don't so much send chills up your back but invigorate you(! ), Season of Arrows would make for a lovely, night-time companion! You can find out more at either of the links below.